H4P were invited to attend the 10th ICAANE Conference to present their work. As part of this conference, many attendees, including H4P, signed the Vienna Statement. on April 27 during the Special Section “Heritage under Threat”. It communicates the commitment of the participants towards the safeguard and help to restore, document and conserve archaeological monuments in the countries of focus of the ICAANE. It can be found on the homepage for download. On April 15 H4P’s Emma Cunliffe presented work by H4P at CBRL / SOAS Past in the Present of the Middle East Conference with “The Extraordinary Ordinary Syrian: Local, national and international perspectives” A copy of the programme is here. Based on the research, Emma writes for The Conversation. Isber Sabrine gives an interview about Palmyra (in Spanish), read it here. On April 26 2016 Emma Cunliffe is interviewed about H4P’s work in Pacific Standard. H4P’s Emma Cunliffe and Marina Lostal from The Hague University of Applied Sciences co-author an article on ‘Cultural Heritage Discourses in the Syrian Peacebuilding Process’ in The Historic Environment: Policy and Practice 2016 here. Subscription access required, or contact Cunliffe. H4P has updated its entry on Libraries and Archives on its website, to see more click here. Damaged lion of Al-Lat statue. Photo courtesy of Reuters through Hurriyet Daily News. New details are emerging about the scale of damage in Palmyra’s museum following a visit led by Dr. Bartosz Markowski. See the DGAM account here, ABC News, Hurriyet Daily News and Science in Poland. The Polish archaeological team that recently visited Palmyra completes its report. See the H4P report of it here. In addition, they hosted a one day conference on Palmyra, details here. Syrian antiquities expert Sara Noureddin provides details on her site visit to Palmyra: read Syria Direct’s article here. 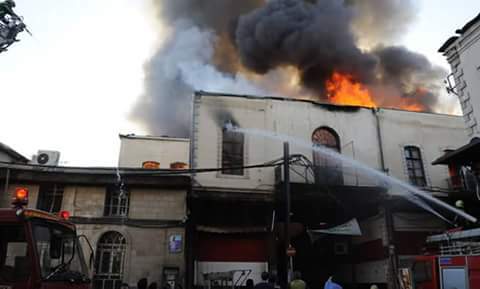 Fire breaks out in Al-Assroniyah marketplace in Damascus April 23 2016. Photo courtesy of DGAM. On April 23 2016 DGAM reported a significant fire in Al-Assroniyah market near the Damascus Citadel in the old city. Find the DGAM report here, IB Times and MEDMAK blog (in Arabic). Details of Meeting 1, Addressing the illicit trafficking of cultural property at the end of the market chain, held in March, available here. Details of Meeting 2, Curbing the illicit trafficking of cultural property : focusing on countries of transition and the application of criminal justice, held in 28 April, available here. Meeting 3 is sheduled on 27 May. Webcast: The movement of cultural property in 2016: regulation, international cooperation and professional diligence for the protection of cultural heritage. available here. A presentation by Samuel Andrew Hardy: Archaeomafias traffic antiquities as well as drugs, given to UNESCO is available online here. A presentation by the International Association Of Dealers In Ancient Art: Headline Figures And Misleading Statistics Relating To Antiquities And The Syrian Crisis, given to UNESCO is available online here. ConflictAntiquties follows on from BBC Radio 4’s File on 4 examination of the link between Daesh and the looting of antiquities. Read more here. The Times is reporting that an artefact stolen from Syria has shown up for sale in London. For more information see here (Requires login details). MANTIS (Modeling the Antiquities Trade in Iraq and Syria) discusses the recent sale of artefacts from Palmyra in Raqqa in a report by NBC. However Sam Hardy of ConflictAntiquties discusses whether one of these antiquities was in fact a fake here. The DGAM released a statement on April 13 2016 about its vision for the reconstruction of Palmyra which you can find here. The ARCA blog comments on this statement, adding “Syria’s heritage staff deserve encouragement and support, not magnifying glass criticism before conservation projects have even get under way.” Read about it here. An open letter to UNESCO from Le Patrimonie Archaeologique Syrien en Danger on April 12 2016 which voices concerns over the possible restoration of Palmyra and the fact that Russia may emerge as “the only partner for the restoration of [Syrian] national identity.” Read about it here. SHIRIN also urges caution on plans related to the reconstruction of Palmyra on April 14 2016. See their statement here. In addition, Blue Shield issued a statement on Palmyra on April 22 2016, urging caution in the development of plans for the sites’ future – read more here. The DGAM reports that UNESCO has sent experts to record the damage at Palmyra and report on it here. Four UNESCO employees from the Beirut and Paris offices visited Palmyra on April 25 2016: UNESCO’s press releases on the situation are available here and here, and are covered in Sputnik news here. A Russian resolution regarding the role of UNESCO in restoring Palmyra is approved by UNESCO. Read the resolution here. Read about it from RT.com. They have built an open-source, interactive, data-rich map of the city of Aleppo, at the neighborhood scale. Users can navigate the city, with the aid of high resolution satellite imagery from before and during the current civil war, and explore geo-located data about cultural sites and urban damage. They will add data as it becomes available; currently they are grateful for datasets from from Human Rights Watch, the United Nations Operational Satellite Applications Programme (UNOSAT), and the Humanitarian Information Unit (HIU) at the U.S. Department of State. The project is also available through the website of the Aleppo Project here. The team encourage people to upload information to the map. ASOR CHI and UC San Diego’s new Center for Cyber-Archaeology and Sustainability (CCAS) are working with the year-old crowdsourcing portal TerraWatchers to carry out a joint online mission to monitor nearly 11,000 archaeological sites located in Syria, Iraq and Lebanon. 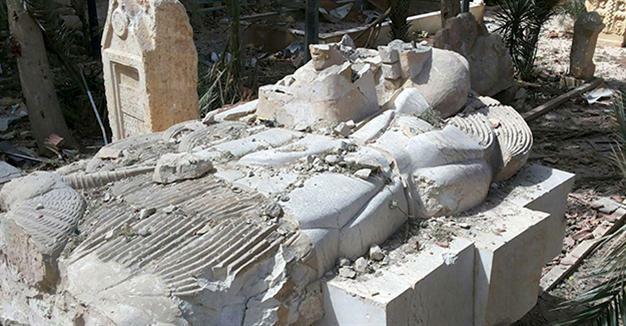 On April 13 2016 the Antiquities Coalition launched it’s #Cultureunderthreat Task Force Report, with multiple recommendations in how America can fight “cultural crimes”. Read details of the launch, the executive summary, and download the full report on their website here. The launch was also picked up the New York Times. The US Senate votes to ban the import of Syrian artefacts on April 13 2016, and has now submitted HR 1493, ‘The Protect and Preserve International Cultural Property Act’ to President Obama for signature. Once complete, the act will: 1) set up an interagency coordination committee to coordinate the efforts of the executive branch to protect and preserve international CP at risk, and 2) impose import restrictions with respect to archaeological and ethnological material of Syria. Read more here. Congrats to all the hard work of those who have helped with this bill. Also view the NY Times article, Art Newspaper. “Because the House of Representatives originally passed H.R. 1493 in a form that is different from what the Senate adopted, legislators now must reconcile the bills’ differences”, in his blog Cultural heritage lawyer. Members of the G7 affirm their opposition to the destruction of cultural heritage in a communique issued following their meeting in Hiroshima. A replica of Palmyra’s destroyed arch has been reconstructed in London, before moving on to other cities. DGAM coverage here. For news coverage and criticism you can read Counterpunch, The Conversation, TGN Review, IB Times, Times of Israel, Hyperallergic, Washington Post, Art Lyst and Emirates 247.
people were invited to fill out postcards “on which they were able to share any memories of the site and any thoughts, hopes and fears for its future, including whether it should be reconstructed or not”. Micropasts have crowdsourced transcribing them… (and a bunch of other stuff), and will hopefully publish them soon. On Tuesday, 26 April 2016 at the “Kunsthistorisches Museum Wien”, Austria, a new session of the “ICOM Palmyra Talks” was held, drawing an audience of some 200 attendees. Initiated by ICOM Austria under Chair Dr Danielle Spera, Director of the Jewish Museum Vienna, the objective of the event was to enhance public awareness of current threats to heritage sites arising from war and destruction, notably in Libya, and present solutions for the protection of cultural heritage. On this occasion, ICOM presented its Emergency Red List of Libyan Cultural Objects at Risk in German translation, following the list’s initial launch in December 2015 in Arabic, English and French. The DG of UNESCO Irina Bokova also spoke about protecting cultural heritage. Details of the event here. Russia’s Mariinsky Theater Orchestra performs at the amphitheater in the Syrian city of Palmyra, May 5. 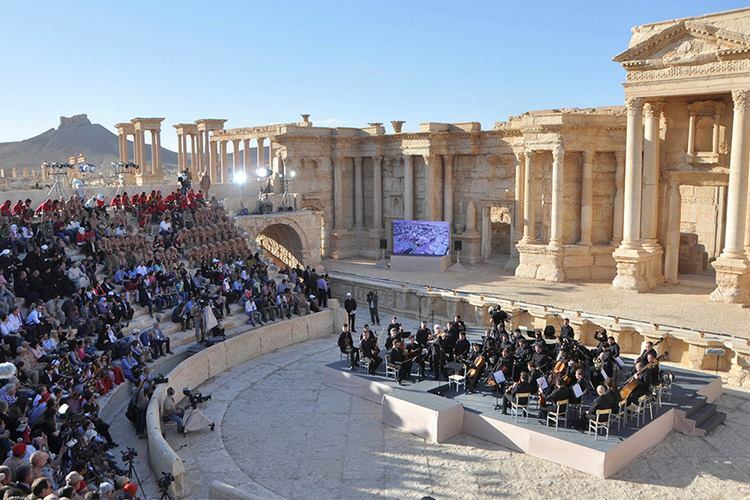 According to the BBC, Russia’s Valery Gergiev conducted concert in Palmyra ruins. ICONEM has posted its 3D model of Palmyra’s ruined Temple of Bel. Le Figaro interviews Yves Ubelmann on plans to digitize Palmyra in 3D. More details from Le Figaro and France 24 (both in French). Iran announces its willingness to restore damaged monuments at Palmyra, read more at Counter Punch. Franklin Lamb asks whether Responsibility to Protect applies to cultural heritage protection in Syria, in Counterpunch, here. In the Conversation, Augsten argues that the debate about reconstruction is ‘worryingly colonial’, here. In probably the ‘must read’ counter argument for restoration, The Guardian argues that “Palmyra must not be fixed. History would never forgive us”. Intern UNESCO says despite damage Palmyra still has ‘authenticity’ Read more at Straits Times and Smithsonian Magazine. The Washington Times discuses possible restoration of Palmyra. Franklin Lamb analyses the international debate about restoring and protecting Syrian heritage on April 16 2016 with Counter Currents. The Telegraph considers the reconstruction of Palmyra’s Arch of Triumph in Trafalgar square. The Jerusalem Post criticizes UNESCO’s plans for Palmyra in this article. The National looks at plans to ‘revive’ Palmyra here. On April 14 2016 Apollo Magazine looks at Palmyra’s legacy in this article. Breitbart reports Daesh is committing ‘cultural genocide’ in an article here. RT KRCW’s To The Point examines Daesh and cultural heritage here. The Rocky Mountain Telegram examines efforts by Syrian archaeologists to save artefacts from Daesh. Find the full article here. Yale Political Scientist Jason Lyall discusses looting and antiquities destruction here. The DG of UNESCO Irina Bokova talks about protecting cultural heritage at Yale University on April 12 2016. Read the Yale article here and here. Professor McGuire Gibson reminds VOA readers that despite the recent capture of Palmyra many of Syria’s other sites remain at risk. Get more information here.